Spiders love to nest inside gas grill burner tubes and this can happen at any time of the year. When a spider nests inside the burner tube, it creates a web that blocks the free flow of gas to the burner. Even after the spider is gone, the web will remain and so does the blockage. If the burner is badly blocked it can result in a flash back fire – a fire at the front of the grill, particularly in the area of the control panel. How Do I Know If There is a Spider Web Blockage in My Burner? Higher than normal flames from one or more burners. These will typically be orange in color. Flames that are not evenly distributed across the entire burner. Control knobs are hot to the touch. Flames at the control panel of the grill (Alert! You have a full blown flash back fire on your hands). 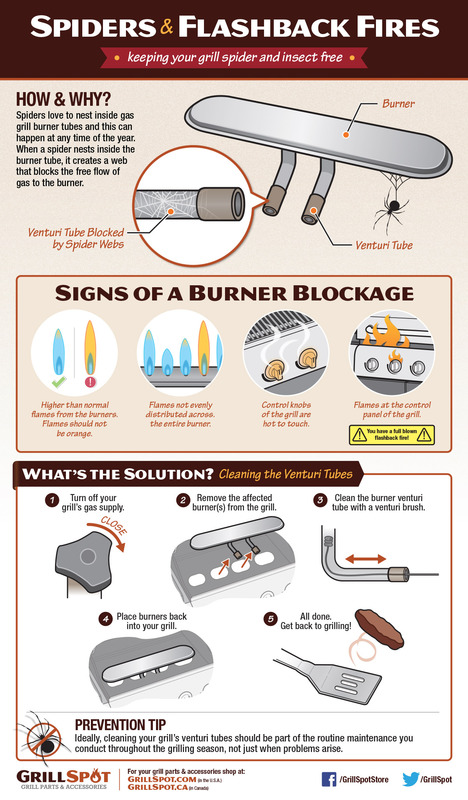 Remove the affected burners from the grill and clean them with a venturi brush. Similar to a bottle brush, a venturi brush has bristles on a long flexible rod that allow you to scrub the inside walls of the burner tube. If you don't already have one of these you can buy it from us here. Ideally, this procedure should be part of the routine maintenance you conduct on your grill throughout the grilling season, not just when problems arise. What Do I Do If There's a Fire? In the event of a full blown flash back fire, turn off the gas at the source and wait for the burners to cool down before cleaning them with the venturi brush. Depending on the severity of the fire, you should check damage to the control knobs, front panel and gas train.